New! 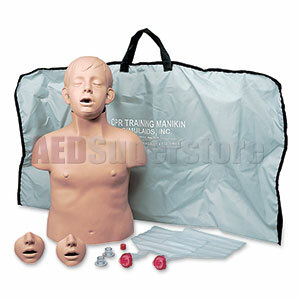 Specialized item for training of CPR on children. Brad Jr.'s realistic appearance, accurate anatomical landmarks, and individual-use mouth/nosepieces with disposable airway/lung system and non-rebreathing valve combine for function, durability, and ease of use. The convenient nylon carry bag can also be used as a kneeling pad when empty. Approximate age: 7 years. Size: 27" x 17" x 10"